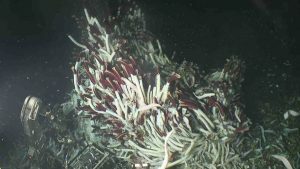 2017 is a big year for hydrothermal vents, marking the 40th anniversary of the discovery of life in darkest depths of the ocean. It was an astonishing find. Entire ecosystems supported by chemicals rather than sun, like something out of a Ray Bradbury novella. 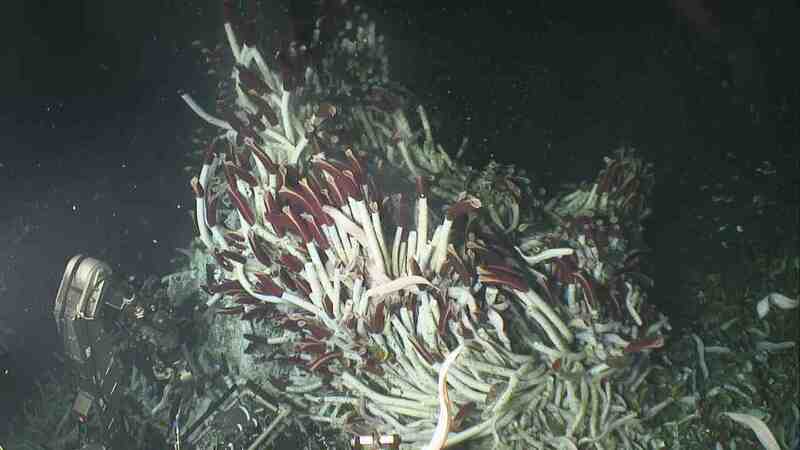 The discovery of vent ecosystems is so new that its pioneers are still working. 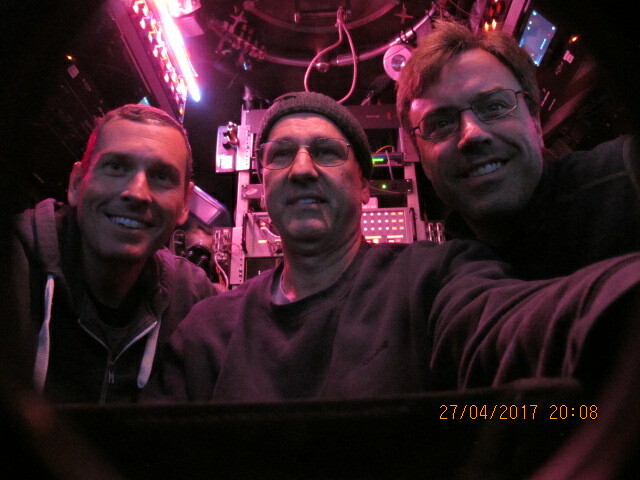 And so, my first dive in Alvin is with pilot Pat Hickey and senior scientist Horst Felbeck, two such pioneers. Horst has been on about 30 dives, an impressive number for a scientist. This is Pat’s 681st dive, a record by a landslide. Both have been visiting vents since their discovery or close to it. 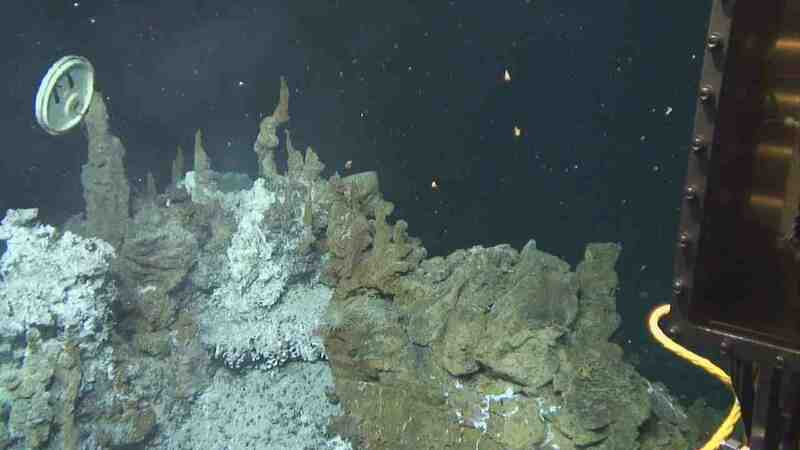 In contrast, I was born into a world where vent ecosystems were known, though still very new and astonishing. 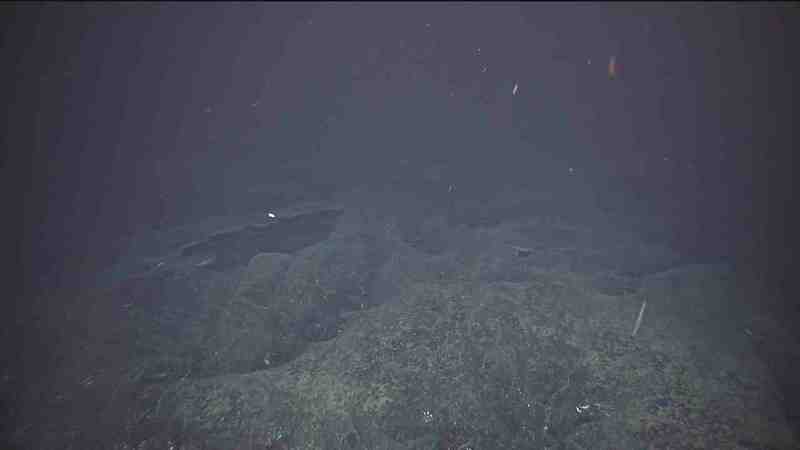 They still seem new and astonishing to me, as the bottom comes into view and we transit to the first stop on our undersea itinerary, a burst of life in a cold, volcanic world. It feels strangely intimate to peek into the lives of these creatures. Most are blind, and some are eyeless; like animals from deep caves, eyes are useless in a dark world. This means that, diving, Alvin’s lights don’t bother them. They’ll shy from movement in the water, but if the sub is still, they just go about their day as usual. It’s an unusual feeling, being able to watch animals so closely without disturbing them. Pale, wrinkled, worm-like fish dart back and forth in front of our windows. Tubeworms sway gently and suddenly retreat when hungry crabs come by, pulling extravagantly red plumes into the safety of translucent white tubes. A squat lobster, curious, perches on Alvin’s robotic arm and rides along with us for a few minutes before jetting off backwards to more pressing lobster business. It’s surreal to watch this marine scene play out just beyond my fingertips, knowing that it’s happening under enough pressure to crush a car. We are, of course, not just here to sight-see. There is work to be done, samples to be collected for a wide-ranging team on the ship one and a half miles above. Pat, our pilot, does most of the work. He is astonishingly good, and he makes a fine undersea fisherman. My work is first on the list, retrieving a crab trap from the side of an undersea pillar and replacing it with a new one. I got skunked: the trap is empty. (Sardines in oil are apparently not the exotic delicacy I was hoping they’d be.) Pat is undeterred. He uses Alvin’s port arm, the more agile of the two, to crush a few large mussels and put them in the insulated biobox on the front of the sub. The crabs smell food, and greedily move in to check out this unexpected windfall. As they approach the rim of the biobox, Pat gently nudges them in with Alvin’s arm, so that they land unharmed in the bottom of the box to gorge themselves on a last meal. Fishing expedition complete, we move on to the main event, collecting samples of water and microbes for most of the rest of the science party. (Horst and I are unusual on this cruise in that we study things you don’t need a microscope to see.) We stop at a shaggy white mound, ripples of hot water rising visibly from a few openings. 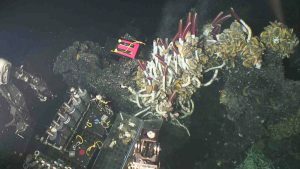 This is an accumulation of sulfide from the water, covered with the tubes of small heat-loving bristleworms named Alvinella after our vehicle. The Alvinella are handsome creatures, squat and red and with little gray pelts of bacterial growth on their backs. They’re much cuter than they sound, and look about as jolly as it’s possible for a worm to look. They’re one of many biological marvels down here, thriving in extraordinarily hot and chemical-laden water. We take a sample of the mound and the worms, collect some hot outflowing water, and place a bacterial colonizer in the area hoping to attract microbes previously unknown to science. Next stop: black smokers. On land, these might be hot springs or geysers. 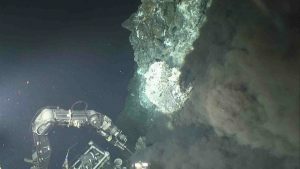 At 2,500 meters depth, they’re knobbly spires of accumulated minerals, sending up constant pillars of superheated black “smoke”. They are perhaps the more surreal part of an already-alien landscape, transient cathedrals looming above the bustle of life in neighboring, lower-temperature areas. We measure 360°C in one smoky outflow, using a temperature probe designed to handle the volcanic heat, and take a water sample for the geochemists. 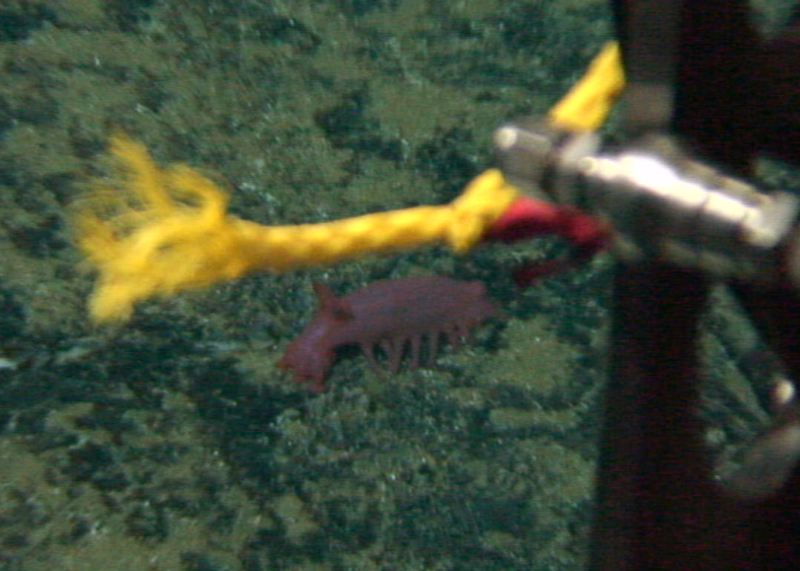 The last item on the dive plan is collecting tube worms for Horst’s team. We visit one mound covered with an extravagant tangle of worm tubes and crawling with associated life. It is beautiful, but it won’t do. The worms are nearly six feet long. They won’t fit in the insulated biobox for the trip to the surface, and, Goldilocks-like, Horst declares them too big. We zip back to a younger community, which is deemed just right, and Pat plucks worms like flowers, placing the resulting bouquet carefully into the biobox. With that, we are done with sampling. The basket in front of Alvin is full, but we still have some battery charge left. “Let’s have some fun,” says Pat, and takes us away from the crags and valleys of the central volcanic area to the relatively flat and lifeless surrounding lava fields. “OK, who wants to drive?”, he asks. I do. 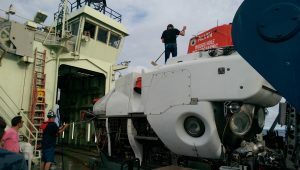 It’s a surprisingly delicate operation, a smooth ride, with the buoyancy of the sub making it feel entirely unlike driving a car. “You can go a little faster or we’ll never get there,” Pat prompts. I speed up a little, carefully. 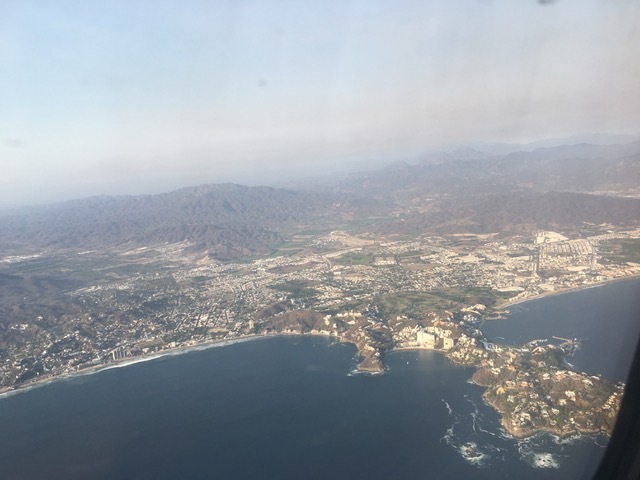 The bottom glides by, volcanic undulations dotted here and there with a long-legged red shrimp, glass-clear sea cucumber, or, once, a starfish the size of a dinner plate. Away from the heat and the energy of the vent field, life is sparse, but present. I return the helm to Pat, so we can head back into the canyon and look for Flea Vent, a feature Horst named on a prior trip. We find it, maybe. It can be a little hard to tell. 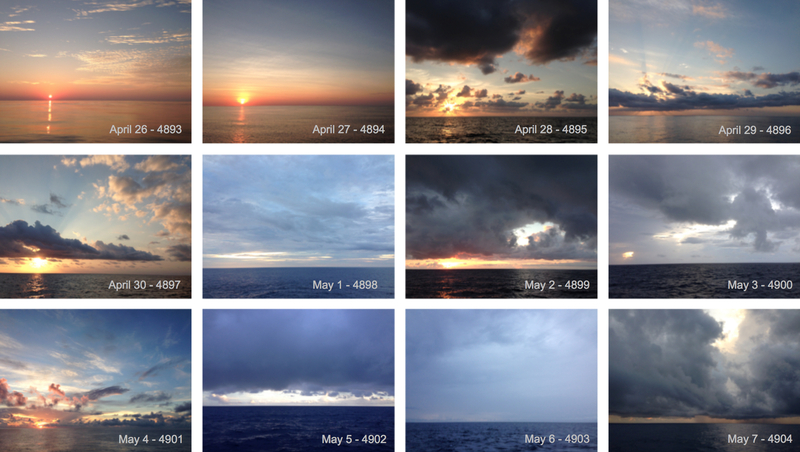 This is a transient landscape. 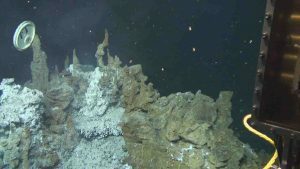 Vents form at active volcanic sites. Spires fall; vents erupt or go dead; lava flows; biological communities rise and fall in concert with geological shifts. Flea Vent (we think) is an isolated tower with a delicate, almost lacy collection of spikes on top. It must not be too active now, since the only life seems to be a few anemones and a small cave writhing with half a dozen blind white fish. With this, our battery is nearly spent, and it’s time to head back. Pat drops some weights and the sub starts to lift. Soon the bottom is no longer visible, and Pat turns off the lights. We rise in darkness, broken by flashes and blinks of blue-green bioluminescence out the windows. It takes about an hour and a half to get to the surface. As we wait, I watch the jelly creatures flicker and we all eat our packed lunches, peanut butter sandwiches and Hershey bars. A fine meal for the grade school cafeteria and a voyage to the bottom of the sea alike. Back on board Atlantis, the dive is over for Pat and Horst, but not for me. There’s a tradition surrounding first dives, and mine is no exception. Stefan hugs me, then steps away as Sean and Francois swoop in and give me crab claw gloves and a tubeworm tube to pretend to nibble, crab-like. Thus adorned, I’m baptized with a couple of buckets of ice-filled seawater. My first dive ends this way, dripping and grinning, dreaming of future cruises and future dives and forty more years of astonishment. and even a stack of O2 tanks. The sounds are similar as on an airplane and the cabin glows in dim red light. It was a little bit cramped for 3 people, but there is room to stand and the observation posts are well cushioned. I took up position on the starboard side and had 2 view ports to look through as well as control of 2 outside cameras with the ability to zoom in and record things at very high resolution. After about 90 minutes of descending through the water column of complete darkness with the exception of thousands upon thousands of bioluminescent jellyfish passing by the view ports—a truly amazing sight to see—we came up on the seafloor. The first noticeable images were of volcanic lava tubes with sections caved in and glassy lava rock everywhere. We proceeded to a couple of the sea vents we are studying and began making observations, measuring fluid temperatures and collecting animal specimens such as riftia, mussels, and crabs. As the dive continued the cabin temperature dropped (due to the cold water surrounding us) and it became necessary to put on hats, sweatshirts, and extra socks—a small price to pay on such an incredible journey! 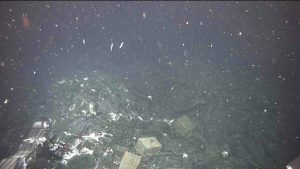 One of the most amazing things to see down there was the spectacular shimmering of the water resulting from warmer vent fluids spewing out of the sea floor into the much colder seawater. It looked a bit like the distortion seen in the air over hot pavement in the summer, only much brighter and cleaner. Aside from seeing the dominant animal species such as crabs, lobster, shrimp, riftia, and alvinella, we were also fortunate to spot octopods and even a sea pig! Eventually it was time to take a break. We enjoyed a small lunch consisting of sandwiches, fruit, and water—unfortunately we weren’t able to find a Krusty Krab nearby (for anyone who has watched Sponge Bob cartoons)! fluids. Fortunately, after about an hour, I spotted the markers left at this vent site back in 2014. We made some observations and measured the vent fluid temperature thereby completing our primary objectives for the dive. All too soon it was time for our dive to come to an end and we began the ascent back to reality (with coffee and cookies of course!). Floating back up and watching the thousands of jellyfish pass by was peaceful and surreal and it provided me with a few minutes to contemplate the adventure. Each vent at this research site, in and of itself, is unique. 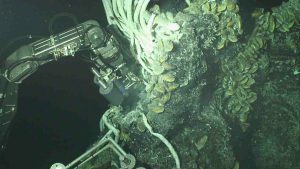 However, there are many observable patterns and similarities shared across this site that allow us to ask questions and draw conclusions about the importance of deep-sea vent systems at the ocean floor and, ultimately, their role in the health of the Earth’s oceans. 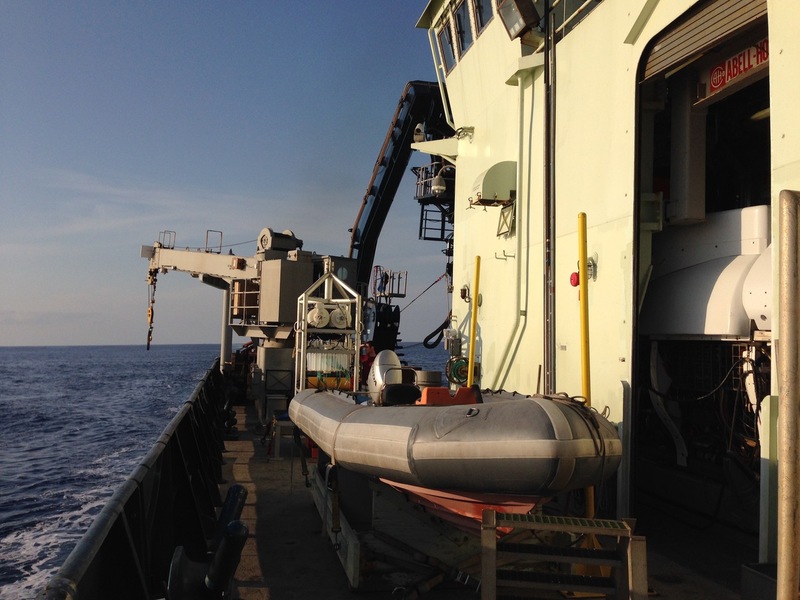 As scientists, we are fortunate to have the HOV Alvin, the RV Atlantis, and their crews to assist with our research. All in all, this was one of the most amazing things I’ve ever done, I am grateful for the opportunity and I hope that I will find myself in a position to log another dive in Alvin someday soon! 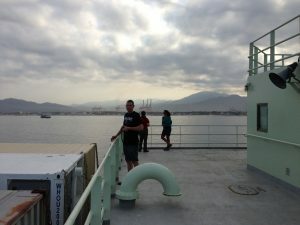 We left Manzanillo this morning and have nearly 12-hours of “steaming” under our belt, which means we’re now about 200 miles from land. We are heading in a straight line south from Manzanillo, Mexico. 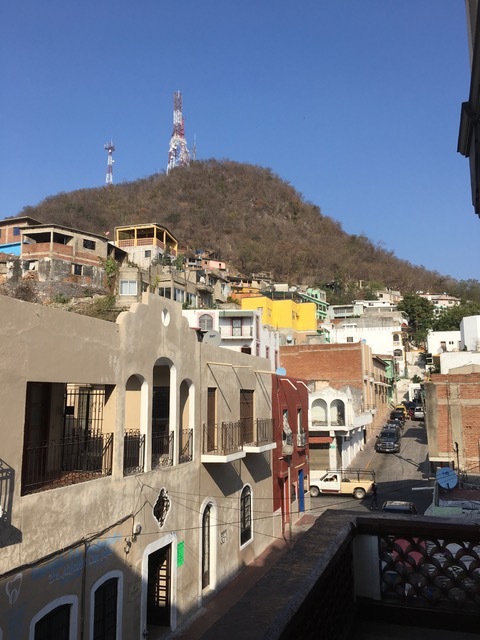 The weather is feeling more tropical, clearer, and warmer than in Manzanillo. 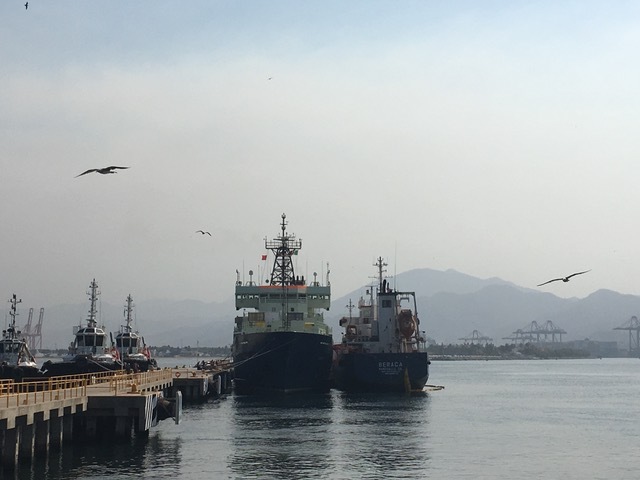 The gannets (sea birds) are gliding back and fourth above the bow of the ship, like they did last time at this location. People are working on getting their “sea-legs.” Although we are currently under calm seas, some of the science party are not feeling great as we have slow and long rolls, which take some getting used to for those prone to sea sickness (like myself). Personally, my medication is doing a great job (knock on wood), and I’m not feeling sea-sick at all. Back at the dock yesterday morning, our container arrived, which was a mile stone and great accomplishment, given the challenges of shipping abroad. Our container looked rather puny compared to the massive number of containers in Manzanillo’s port. 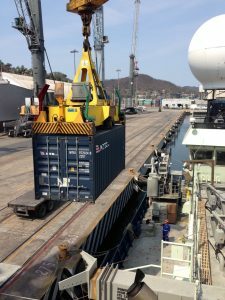 The Mexican crane operator was very skilled and placed our container on the ship, inches from walls of the deck. 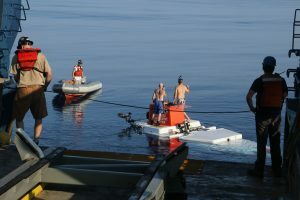 The Atlantis crew was incredibly fast and efficient unloading the container, and within minutes the empty container was loaded back off the ship. We did major unpacking and setting up of the lab yesterday and today. 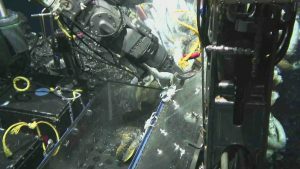 The pressure of the first submersible is starting to mount. 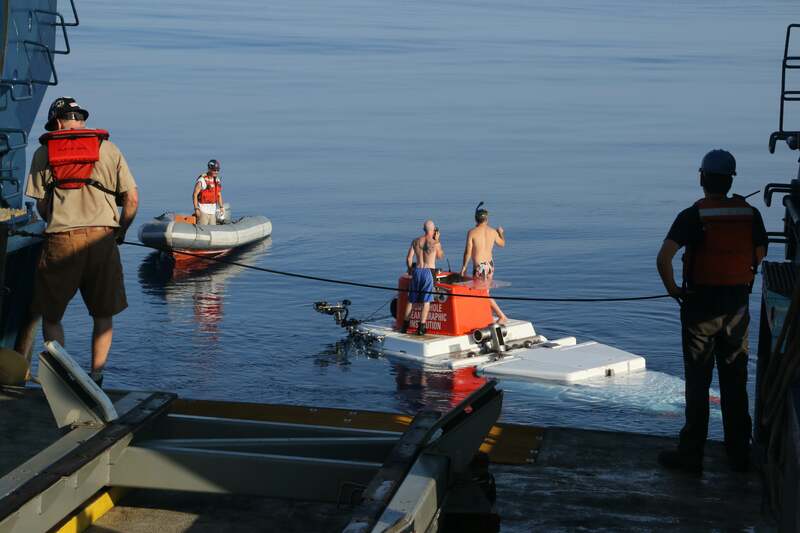 We need to have the vent-submersible incubation device (Vent-SID) set up and ready to deploy by Wednesday evening. This will require almost around the clock work from at least four scientists, myself included. 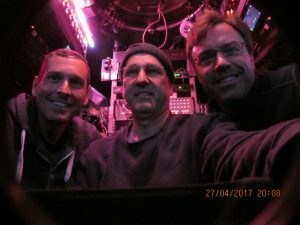 Craig Taylor and Ed Hobart (WHOI scientist and engineer, respectively) are in charge of setting up the electronics and sensors on the “SID.” Stefan Sievert and I are in charge of getting the sampling collection side of the SID ready. 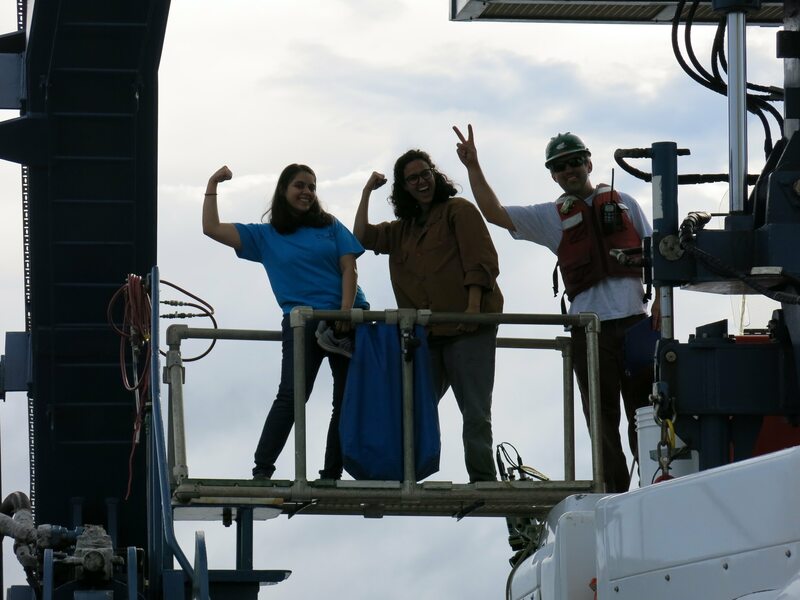 We also get excellent help from Diana Vasquez-Cardenas, who has previously studied chemosynthesis in coastal sediments for her PhD. Sean O’Neill, my supertech, is working out computer glitches of the computer he will use to run our “Nox-box,” which measures nitrate samples as part of the Vent-SID incubations. 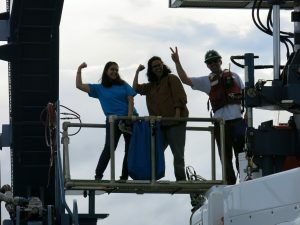 I was just working on the Vent-SID out on deck, plugging in large deep-sea batteries (like a car battery but twice the size) in the evening sun, and quickly worked up a vigorous sweat without much effort. As today was our first day at sea, it was full of customary orientation and safety drills. We did a muster station and abandon ship drills, wearing our life jackets, and carrying our survival suit bags. People who have not been at sea before got to try on their survival suits, which makes them look like giant red gumbies. 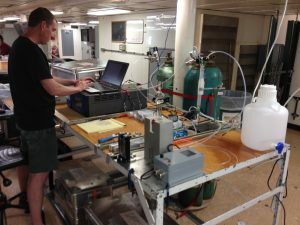 We had our first science meeting, during which Chief Scientist Stefan Sievert gave an overview presentation of the major objectives of the cruise, which are to deploy the Vent-SID to determine rates of chemosynthetic activity on the sea-floor, which has not been done previously. All the scientists were fitted for oxygen masks in the Alvin (the masks have never been used in real-life in Alvin, thank goodness!). These usually do not form a seal around the face of bearded men, so some of us, including myself, have freshly shaven beards. 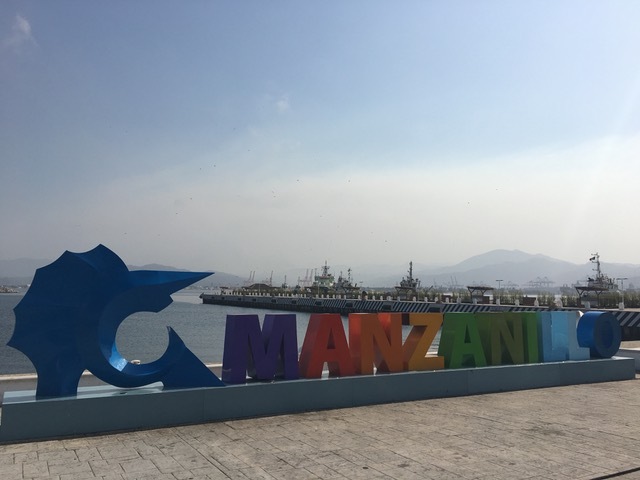 It is very exciting to be back in Manzanillo, Mexico meeting up with old friends and meeting new ones, scientists and crew, to embark on a research cruise to study deep-sea hydrothermal vents. 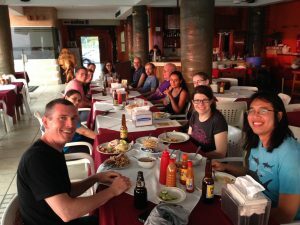 Many of us caught early morning flights from New England, eventually meeting up at the Mexico City airport to catch our flight to Manzanillo. We arrived in Manzanillo to warm ocean breezes and the setting spring sun. Driving into the historic part of town, we were excited to see our research vessel, R/V Atlantis, sitting at the dock. We checked into our hotel near the ship and the next morning moved on the ship. On the ship, we are getting settled in, and exploring our new quarters, figuring out where we will set up our labs. We’ve encountered a few delays in clearing our research equipment and supplies from customs, but things are looking promising. We have our fingers crossed that we have our supplies tomorrow, and will begin setting up our labs and instruments. 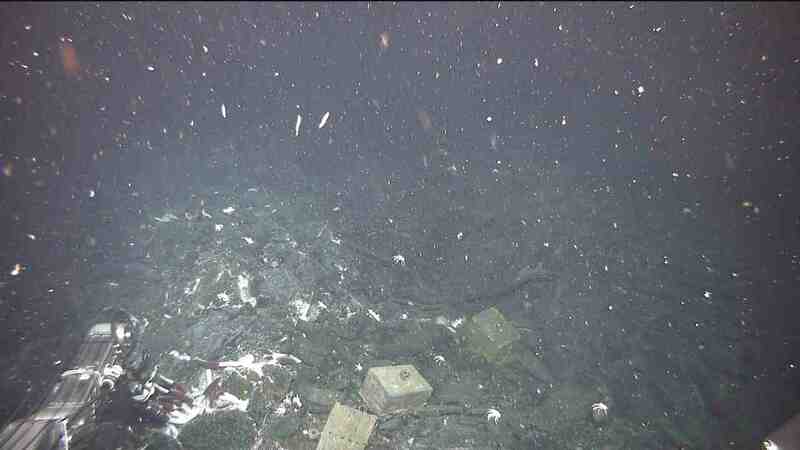 We have one more day in port and then a two-day transit to the vents sites. The next three days we will be busy setting up the labs to be ready for our first Alvin dive!